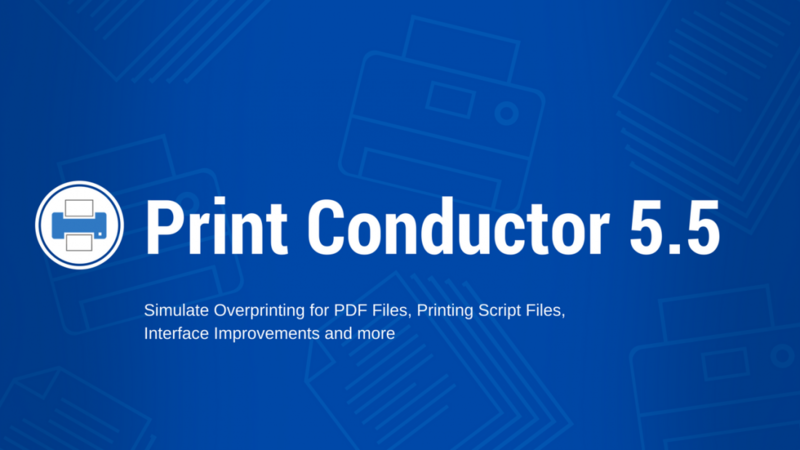 Simulate Overprinting for PDF files and Print Script Files in Print Conductor 5.5! The new version of Print Conductor is on its way! In the new update we added support for more formats, made an important feature for PDF and improved the interface. We added a new formats available in Print Conductor: Microsoft Project MPP format and different types of script files: BAT, CMD, Java, VBS, PS1 and PS1M. PDF files are commonly used in the printing industry for proofing jobs before the job is printed on press. You can use the "Use Overprint Preview" (or similar) feature in Adobe Acrobat, Reader, Illustrator, Indesign and other software. This feature is available for PDF files and gives you an accurate simulation of how the job is going to print before the ink hits the paper. Set "Use Overprint Preview" to "Always", so you’ll see how the inks interact with each other on your monitor display. When it comes to actual printing, there is an option to Simulate Overprinting. Simulate Overprinting feature allows to overlay objects in blending mode, so their colors make a mixture of colors. We added Simulate Overprinting feature to Print Conductor 5.5. Enable it in the Ini File Editor - just switch Overprint=0 to Overprint=1. This feature can help you reduce pre-press time, since you’ll not need to waste time on converting your PDF files into other formats in order to keep the overlay effect. We added more flexibility to Print Conductor interface. Now you can arrange and sort files better. There is a new submenu to hide/show particular columns in the List of Documents and also you can swap the columns and arrange them as you prefer.